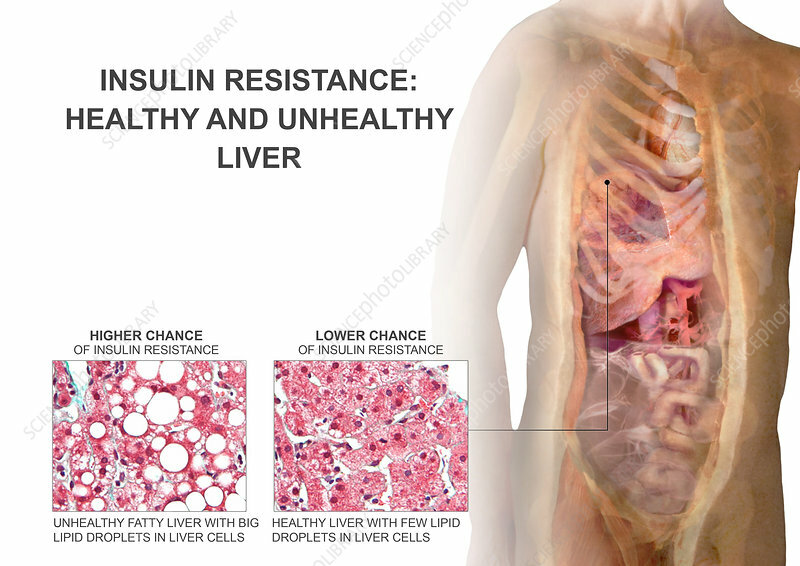 Medical visualization showing a comparison of insulin resistance between a healthy and fatty liver. The development of type 2 diabetes often goes hand-in-hand with obesity. The same lifestyle choices that lead us to pack on fat can also disrupt our insulin response, leading to insulin resistance and diabetes. However, some cellular changes that lead to diabetes can happen in thin people, too. For example, a lipid structure called diacylglycerol (DAG) forms very active lipid droplets inside cells. The DAG droplets form membranes that control movement of more lipids into and out of the droplet. Researchers have found that the more DAG present in a patient's liver, the more insulin-resistant the patient is likely to be. They say DAG is a much better predictor of insulin resistance than obesity alone. A thin person with fatty liver resulting from an excess of DAG may well develop insulin resistance and diabetes.